Preparation time: 13 minutes. Baking time: 20 minutes. Preheat oven to 400°F. Cut eggplant in half lengthwise. Place it on a baking sheet with cut sides down. Bake in hot oven for approximately 20 minutes, until skin is dark and eggplant is soft and cooked through when pierced with a fork. Meanwhile, place garlic in a small mixing bowl; add tahini and lemon juice. When eggplant is done, remove from oven and run cold water over eggplant halves for one minute. Drain water and cool slightly. Remove skin (it will peel back easily). Dice the eggplant and place it in bowl with tahini mixture. 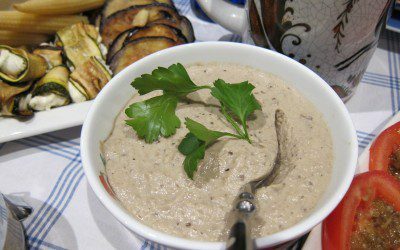 Mash the eggplant with the other ingredients to make a lumpy dip. Sprinkle with parsley and cayenne pepper, and drizzle the olive oil over the top of the sauce. Chill until serving time. Serve with pita triangles. Exchanges per serving: 1 nonstarchy vegetable, 1 fat. Carbohydrate choices: 1/2.